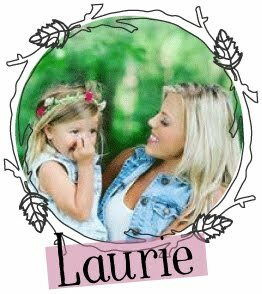 I sure hope everyone is having a great week! I seriously can't believe that Christmas is in 2 weeks. I MEAN WHERE DID THE TIME GO? I know I say that all the time but I'm literally over here so confused right now. 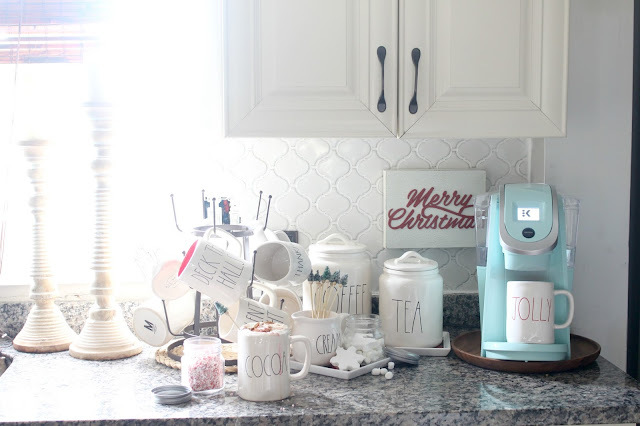 This is absolutely one of my favorite times of the year, there is so much to love about the season and I just try to soak up every single second. That being said, since I've spoken once or twice about my love for Christmas (okay..maybe a little more than once or twice..) you probably also know that no space in our humble abode is spared from some sort of Christmas decoration (or decorations!) 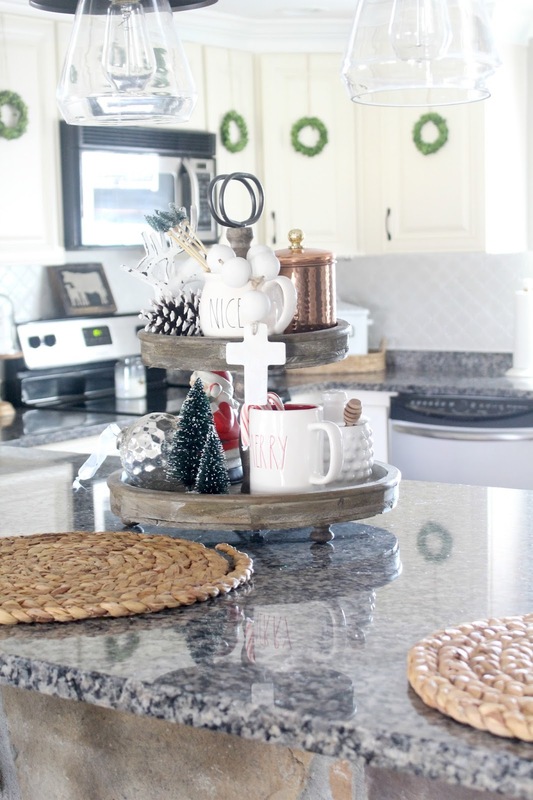 I decided to add some festive cheer to the kitchen using a few simple things that made a big impact. 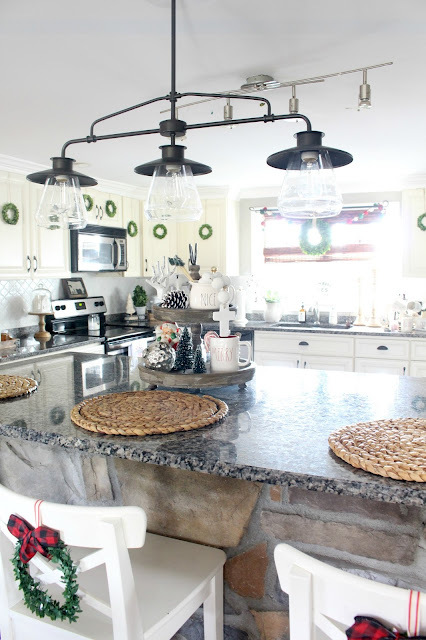 Let's talk about the wreaths..oh my gosh, the wreaths! I got so many questions about them over on Instagram. I got them on Amazon but unfortunately they are all sold out now. :( I've been looking all over for a nice budget friendly alternative with no luck but I did find them here but $20 each is kinda pricey. Maybe every other cabinet? 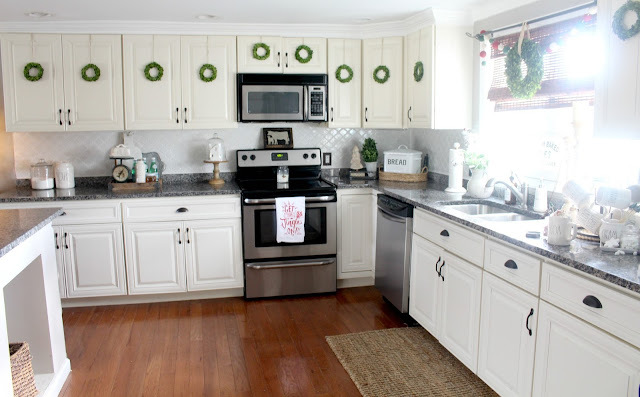 Or maybe you don't have a lot of cabinets like me so the cost wouldn't be overwhelming for them. I will keep ya'll up to date on if I see them again. Promise! 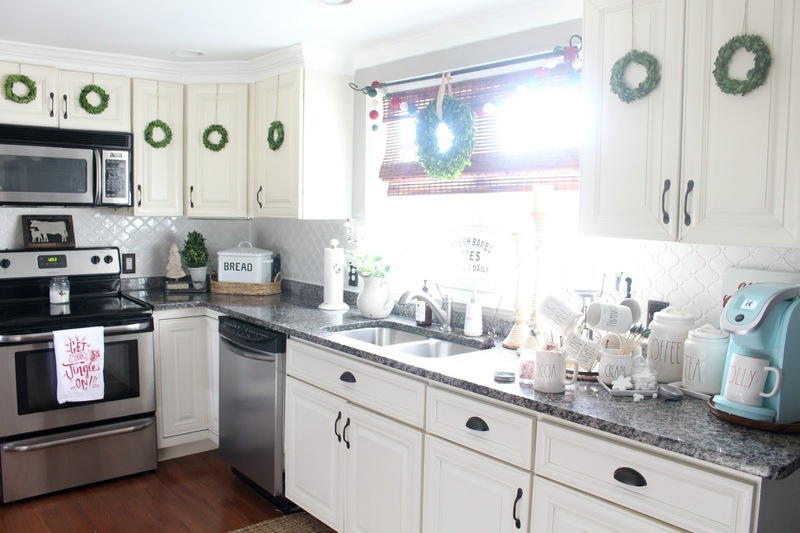 I've also been asked how I attached the wreaths to my cabinets and the answer is super simple, I just use an upside command hooks on the back of the cabinet. I used Twine because that's what I had handy, but any ribbon will do! 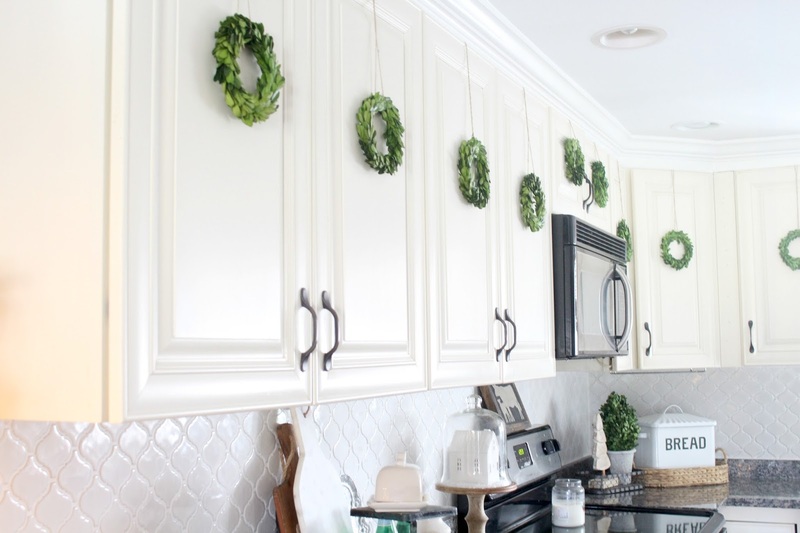 If you don't have luck finding boxwoods, you can find adorable mini wreaths at the Dollar Tree for your cabinets. 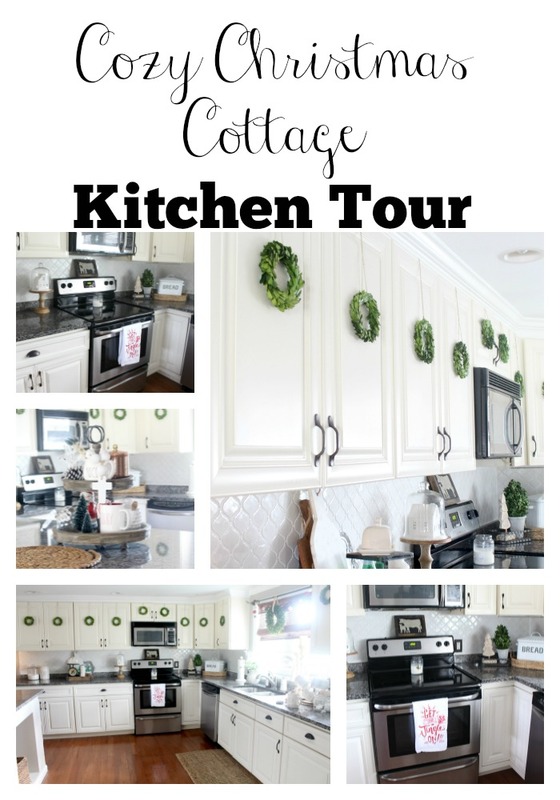 This is a great way to make a BIG impact in your kitchen with minimal work and money. This is also the first time photographing our new back splash in the kitchen! It's been completed for a few weeks, but I haven't had time to blog about it. 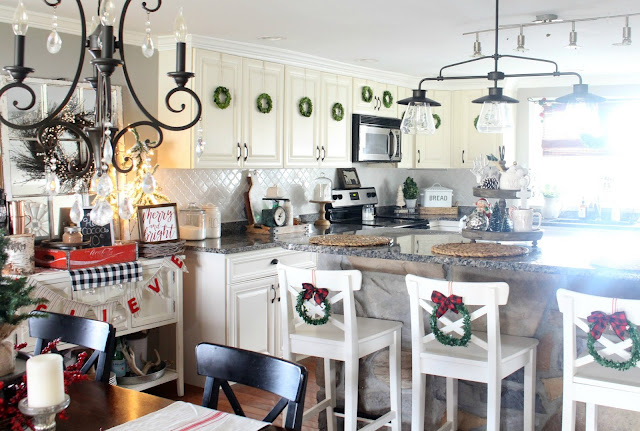 I'm going to do an in depth post shortly but for right now I wanted to focus on Christmas decor in this space. 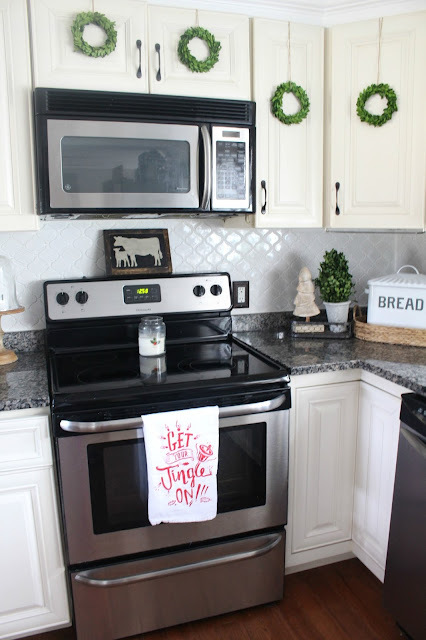 With the new back splash it gives off a very cozy cottage vibe that I just love! Annnnd of course- I couldn't forget to share my favorite tray!!! I filled this one with lots of Christmas goodies! What did you think? 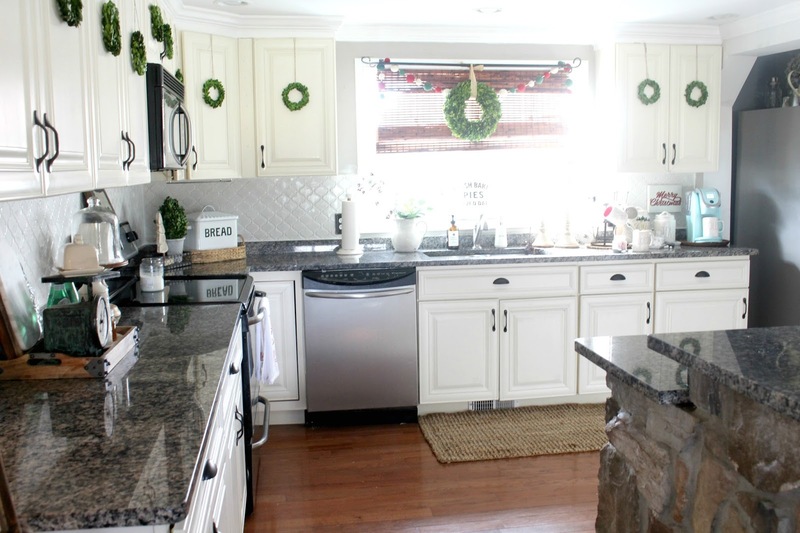 Do you like the back splash? THE WREATHS!!!! 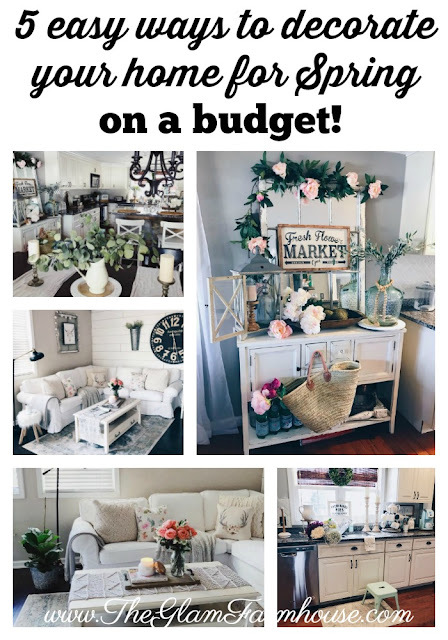 Girl, those just make the decor! Love this! 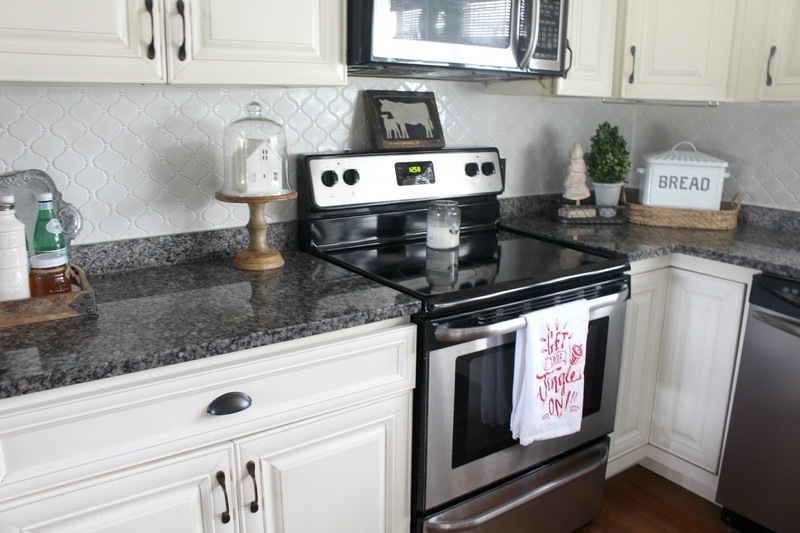 And well done on the backsplash of course!! 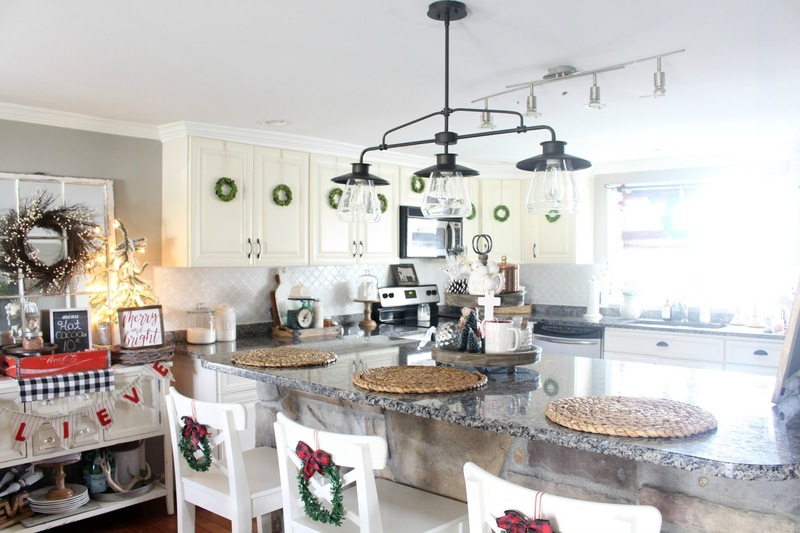 What a sweet holiday kitchen that invites a festive and Merry season. I too use lots of little wreaths in my farmhouse. They are up year round. Very pretty kitchen.